Amazing Race 22, "Working Our Barrels Off"
This week’s Amazing Race splits the five remaining teams into two groups and forces one to scramble to avoid elimination. The interesting part is how they end up divided by several hours during the jaunt through Scotland. The leg begins with the warning that a U-Turn is ahead, but that plays only a minor role in the outcome. It’s the lack of diligence from Joey and Meghan and the roller derby moms that pushes them to the back of the pack. After grabbing what’s apparently the best flight, they celebrate and prepare to grab the top two spots. This type of error happens nearly every season, and it’s easy to understand why they feel complacent enough not to look for better options. The saving grace for Mona and Beth is the fact that they aren’t the only ones to make the mistake. They power through both Detours ahead of Meghan and Joey and live to see another day. It’s clear that the top three teams are working together and will make it difficult for them to make the final leg. The Beekmans proved last season that just surviving is enough, and there’s always a way even when the other remaining teams have banded together. The question is whether enough luck exists for history to repeat itself in back-to-back contests. Teams fly to Edinburgh and drive yet another Ford vehicle to the Gosford House. This is the location for the Roadblock, which requires the players to play a note on bagpipes for several minutes while marching with the Royal Scots. It seems easy for Max and Bates, but Jennifer struggles mightily. The judges don’t seem to hold them to a very high standard; bagpipes are no joke. It’s nice to see a challenge that’s more of a cultural encounter than a nasty experience. The teams enjoy the experience of visiting the stunning castle, and that’s never a bad thing. The downside is that the task has little impact on placement, especially among the top teams. This isn’t a case where the trailing pairs have a chance to make up time. They’re in the back unless something crazy happens. Searching for the clue inside the fireplaces of the Craigmillar Castle is a fun touch but offers few opportunities for a change. The Detour options are “Tasty Puddin’” or “Whiskey Rollin’”, and the choice is easy. Who wouldn’t want to eat some delicious pudding? Unfortunately, that task actually involves prepping haggis, but it’s still the better choice. Max and Katie realize the hockey players will go for the strength task, so they wisely go the food preparation route. For no reason other than being silly, the producers add a Robert Burns impersonator to do a stirring rendition of his poem “Address to a Haggis”. He’s an energetic character though slightly creepy at the same time. It’s probably impossible to extol the virtues of haggis without sounding a little strange. The other Detour involves rolling eight heavy barrels of whiskey to a party. It’s a task that seems faster, but even the hockey players take a good amount of time with it. Bates shows his crazy strength by lifting the barrel over his head, while others struggle to even move the bulky object. The country singers wisely choose the haggis, which may be grisly but seems pretty straightforward. The remaining two teams both choose “Tasty Puddin’”, which means Meghan and Joey are in trouble if they can’t gain an edge with the haggis. They’re fit but lack the strength of Mona and Beth, so the Double U-Turn doesn’t give them a chance to slide into fourth. 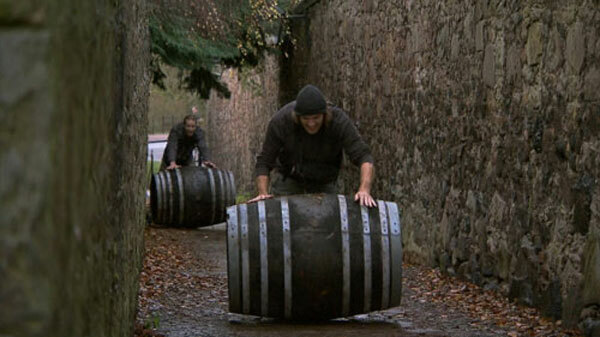 In fact, it takes both YouTube hosts to even move the barrels. That strategy isn’t going to gain any time. Max and Katie and the hockey players both exercise the U-Turn to knock out the other alliance. This makes sense on the surface, but it really doesn’t benefit Max and Katie to knock out a weaker team. They’re still facing off with Bates and Anthony, their biggest competition going forward. On the other hand, the spread between flights makes it a waste to try and take out the hockey players. Picking them would just antagonize the laid-back guys, who would still survive and maybe fall back a spot. Since a bunching is inevitable at the start of the next leg, the gain would be nonexistent. Going with their original plan is the right choice and keeps everyone happy. Looking towards next week’s two-hour finale, it’s easy to put money on the hockey players because of their physical strength. However, that assumes the final challenges are based on that attribute. Other teams are better at navigation and have shown they can move quickly enough through challenges. It wouldn’t be shocking to see Bates and Anthony go out in the first hour. Mona and Beth are the clear underdogs and most likely to exit first, but anything can happen. They overcome a Speed Bump and problems with directions to survive, which shows their resilience. The extra task is a form of Scottish bowling called Skittles, which is easy but takes more time than other Speed Bumps. This isn’t on par with sitting on a block of ice or riding in a traveling sauna. There’s a little skill to rolling a strike using a ball without finger holes. Will their scrappiness be enough to win them the million? This prospect is doubtful, but there’s no clear favorite at this point. My pick is Max and Katie, though nothing would be shocking in this unpredictable season.